<endpoint address="" binding="udpBinding" bindingConfiguration ="MyBindingSetting"
Similarly WCF4.5 provides multiple authentications for single endpoint when using the HTTP transport and transport security. 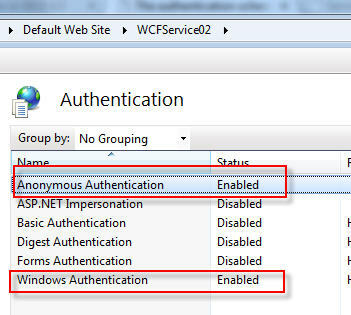 In old version WCF, multiple authentications for single service can be provided by creating different endpoint. But in case of WCF4.5 multiple authentications can be configured using single endpoint. Step 2: Set the security mode to Transport or TransportCredentialOnly and clientCredentialType to "InheritedFromHost"